But to catch a killer, Maggie either accepts her true nature as a "pukkukwerek" - the shapeshifting monster killer of Yurok legend - or more children will die. As the manhunt intensifies and her own family is threatened, Maggie will do whatever it takes to keep them safe. Whether she's awake or asleep dreaming, Maggie is faced with a difficult choice: embrace her heritage - even if it means turning into myth itself - or deny that heritage and lose everything. What did you love best about The Raven's Daughter? Peggy Wheeler really knows how to throw you for a loop with her excellent writing. Going back and forth explaining what is happening in the past all the while drawing you into the heart of the story. Joe Hempel's performance is excellent. This story is an interesting mix of murder, Native American mysticism, childhood trauma and romance. Two stories, one in the past and one in the present, interweave to give us a thrilling, murder mystery with a supernatural twist. The characters have depth, and the plot has enough twists to keep you guessing who the bad guy is. Maggie, a Native American/Irish criminologist, is a great character; she is stubborn, abrasive, intelligent but reluctant to embrace her native heritage and also the man who loves her. Joe Hempel does a great job in the audiobooks. He brings the story to life, gives individual personalities to the characters and makes it easy to delineate between the past and present. This is an gritty, somewhat gruesome crime story that has plenty of twists and is laced through with mysticism and romance. I received the audiobook at no cost and under no obligation. Excellent murder mystery with some added native lore! Retired detective Maggie Sloan teams up with local law enforcement to see who is behind the killing of young twins in her home town. Maggie is a bit more than just a detective but hasn't accepted it yet. She thinks she is dreaming and having visions. This was my first book by Peggy Wheeler. I really enjoyed it and would love to check out more of her work. This wasn't my first book with this narrator. Joe Hempel is an excellent narrator and in my opinion, this is some of his best work! I dreaded the start of each chapter:28 years ago..
Where does The Raven's Daughter rank among all the audiobooks you’ve listened to so far? I really enjoyed the book. I did receive a free copy at my request for an unbiased review so here goes....(Read the review without regard to Audible's questions which is how I wrote the review). I listen to books on my commute to/from work and always looked forward to my drive knowing I'd get to hear a bit more about Maggie and Jake and friends. I knew the start of each chapter was leading to "the making of a killer" but I thought it was actually a really good lead in to the rest of the story. It was like getting 2 stories in one. Parts of the story were predictable but not so much that it distracted from the story as a whole. The characters were developed well (I'm a bit concerned about Maggie's drinking) and would read/listen to more about them if their story continues. The history and folklore also added to the story giving more depth into the characters and their lives. A very well written book especially as a debut novel! This book pulls in from the beginning and holds to the end. Couldn't figure out the short background story at the beginning of each chapter but after awhile it makes sense. All the ravens and the dead mother kept trying to communicate with her but she didn't understand what was happening (but I wouldn't have either). Beautifully written paranormal story. This was the first book I’ve listened to by the author and was impressed. It held my interest with the suspense with the mythology. Has good character development and I loved Maggie and Jacob .I look forward to reading more. The narration was great for the book. I was voluntarily provided this free review copy audiobook by the author, narrator, or publisher. THANK YOU! I received this book free from ebalst, and this is my unbiased opion. this is a good mystery a little slow at first but then you get sucked into the story. I didn't want to stop listening until I found out who the killer was. Maggie doesn't want to work a case involving twin murders. Maggie's character was very well developed. I could feel so much emotion from her. I love that she was combining her Irish and Native American roots. The mystery of who is killing the twins is well written and keeps you guessing. At one time I thought that I had figured out who the murder was (and I was correct), but then convinced myself I was wrong. I also loved that at the start of every chapter we got to discover pieces of why the murder does what he does. To begin with, this seemed a bit off because I didn't realize why a story about a young boy was being told, but after the first few times it happened it dawned on me why the author was doing it. I really wanted to listen to this book from start to finish. Immersed me! Quick moving, great sense of place. Normally don't read paranormal stuff but this was a really fun mystery and the paranormal wasn't heavy-handed at all. In fact, It was fun learning about Native American myths and folklore; it all blended seamlessly with the detective thread. Also loved that the protagonist is an angry woman, full of issues, and dealing with them throughout, often imperfectly. Very real character. That, together with a real sense of place the novel conveys (there in that lovely, small Trinity Alps town in northern California), made for a very enjoyable and page-turning ride. Looking forward to the next Maggie Tall Bear Sloan mystery! The narrator was very easy to listen to--moved between male and female characters well, and the voices were distinct. "Your life is the dream... Fly with us." Wicklow, North California, is a small town of around 3,000 inhabitants, with an unusual claim to fame: it has one of the highest incidents of multiple births in the world. Lots of twins - and someone is killing them. The little bodies, if found, have all had their hearts removed. After returning home from working away in phycological profiling, Maggie is purchased by old schoolfriend Jake to join the police reserves in the hunt for the murderer. This is an unusual mystery thriller in that the concentration is not so much on the killings themselves as on the characterisations of Maggie and her family and other inhabitants of Wicklow, in particular would-be lover, Jake, Maggie's friend, Sally, and a handsome fanatically Christian American Indian to whom Maggie feels an instant attraction. Additionally, at the beginning of each chapter is a very brief "28 years ago" snippet, which slowly reveals the reasons behind the deaths of the children. There is also a gentle paranormal aspect, too, nicely underplayed, with the constant attention of the ravens. As always, Joe Hempel delivers a fine narration, well paced, beautifully read and a pleasure to hear as well as giving individual voice to each of the protagonists. Without him, this book would have been less. There was one major glitch, however, whether in my copy alone or a general production problem, I don't know, but about a minute into chapter six, my book stopped and returned to the beginning. To resolve this, I resorted to skipping that chapter altogether and restarting at chapter seven. There were no further problems. 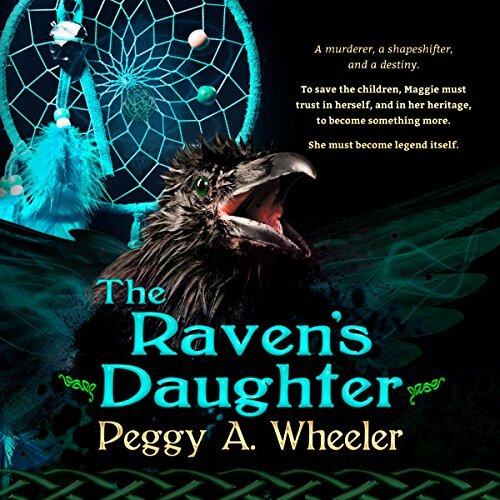 My thanks to the rights holder for gifting me my copy of The Raven's Daughter, via Audiobook Boom. I am undecided about it. For the most part, I enjoyed it very much and the who done it? aspect was well set up. But, although the main protagonists were given life through the thorough characterisations, they remained, for me, unreal. Having said that I would still recommend it as an Audiobook for the pleasure of Mr.Hempel's narration and for some of the interesting stories gleaned along the way. And the cover is stunning. A good first novel. Peggy Wheeler uses "show, don't tell", and the main character Maggie is well-characterised. I particularly liked the early bit of description of Maggie's only wrinkles being crow's feet, even though she rarely smiles. The setting is interesting, particularly the Native American folklore woven throughout. Joe Hempel's narration is excellent, with distinct and consistent character voices. There are some flaws in the story (the disjointed passage of time, the villain's identity being hugely telegraphed, and the villain resorting to a long monologue at the end to explain every last detail), but they didn't hurt my enjoyment. These aspects are why I have called this a good *first* book, and I look forward to seeing what Peggy Wheeler writes next.